DANGER AHEAD: Bal Krishnan Ghimire waits patiently for the traffic to stop before attempting to cross the road in Patan. 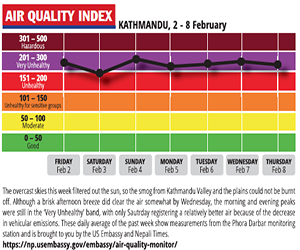 Kathmandu’s streets are what nightmares are made of. The roads are narrow, there are pot holes at every corner, microbuses stop anywhere they want, and reckless drivers try to overtake one another like they are in a race. Like the rest of us, Bal Krishnan Ghimire (pic, right) too navigates through this chaos every day from his home in Jawalakhel to his work and back. But afflicted with polio from an early age, Bal Krishnan cannot walk and has to make this journey on a wheelchair. With no accessible footpaths, his wheelchair is forced to compete for legroom with hundreds of cars, two wheelers, and tempos on the main road. When he wants to visit a shop, he has to first get down from his wheelchair and crawl over the wooden threshold found at the entrances of most public buildings. 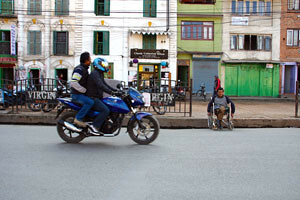 If there was a ‘most-disability-unfriendly cities in the world’ list, Nepal would be in the top 10. According to the 2011 census, more than 500,000 Nepalis (nearly two per cent of the population) have some form of disability and those with mobility disability like Bal Krishnan make up nearly two-fifths of the total. However, under-reporting due to the shame attached to being disabled and the government’s narrow definitions, mean that the actual numbers are higher. Nepal became one of the first countries in the region to introduce a disability act in 1982 and is a signatory to the International Convention on the Rights of Persons with Disabilities. Despite the numerous guarantees and significant aid, the state has little to show for its efforts. There are no policies to assist those on wheelchairs at schools, hospitals, private and government offices, no building codes which make elevators, ramps, adapted toilets, and wider hallways mandatory. Instead, during the road expansion drive the state bulldozed the few sidewalks around the Valley and merged them into the main road. The only relief for the physically-challenged comes from private organisations like the National Rehabilitation Society for the Disabled which distributes hundreds of free wheelchairs annually and the Nepal Disabled Association (NDA) which is giving Jorpati’s streets a disability-friendly makeover (see box). NDA also provides income-generating skills training so that Bal Krishnan and others like him can become financially independent. “I left home at 24 because I felt unwanted by my family. I was depressed. I started learning how to make incense sticks and candles and weave baskets through NDA’s support. Now I earn a reasonable income and being independent has improved my self-esteem,” explains Bal Krishnan. While physically challenged residents of Kathmandu overcome hurdles day in and day out, the lack of disability–friendly facilities is also making Nepal an unpopular destination and keeping potential tourists at bay. “We have been taught to think of people with disabilities as somehow lesser. They don’t deserve the same resources and treatment as able-bodied people,” says Navyo Eller, marketing head of Navyo Nepal, “even small changes like putting larger seats in buses can help, but we just don’t bother.” Navyo Nepal is one of the few travel agencies which arranges tours for disabled tourists by providing vehicles with ample space and mobile toilets for trips outside the city. Despite the challenges faced by the disabled community, there are causes for optimism. The rapid rise and accessibility of communications technology such as mobile phones and the Internet have been crucial in improving educational standards, as well as skill training. Disabled children no longer have to drop out of school due to lack of facilities, if they can learn and study online. But this requires a more involved government and a change in societal attitudes towards people with disabilities. For Bal Krishnan, any support is welcome. “There are signs of change, but progress is still slow,” he says. An entire two kilometre stretch from Jorpati chok to the gates of Khagendra New Life Centre (NLC) has been earmarked to undergo a major face-lift in the next 12 months. With wider, smooth walkways and guide-strips, the community-led project will make travelling much easier for the wheelchair bound and the visually impaired. Home to Nepali Disabled Association (NDA) and SOS Children’s Village, a school for the disadvantaged, Jorpati has a large disabled population and the renovations will make commuting safer and easier for the residents. The road will be named after Khagendra Bahadur Basnyat who founded NLC. Started almost half a decade ago, New Life Centre is one of the pioneer organisations in Nepal to provide physiotherapy and counseling to disabled people. Arun Dev Pant, an architect with Design Cell, together with urban planner Anjan Shrestha, will turn this vision into reality. Trained in the USA, Arun won an award for designing the disabled-friendly facilities at Spinal Injury Rehabilitation Centre (SIRC) in Kavre, and volunteered to help the government design the wheelchair accessible Gokarna Bagmati bridge. With the government ready to cover 60 per cent of the construction cost, locals have begun door-to-door fundraising and organising charity events to meet the remaining expenses. If the committee can complete its fundraising goals, Jorpati will serve as a positive example that the worth of a society lies in how it treats its disadvantaged members. 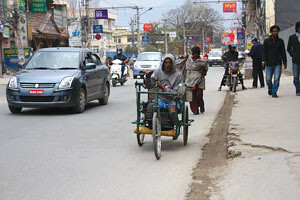 Lack of proper roads and handicap-friendly infrastructure in Kathmandu Valley makes a challenge for mobility-impaired people to move around. 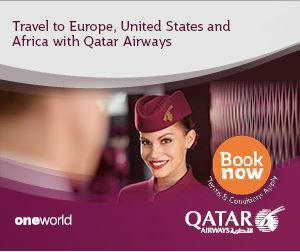 Generate electricity, or protect tourism?